"Doug - Keep them playing the way you do - Great Work. Doug Proper - The Guitar Specialist - is definitely the one guy to see about your guitar work. He makes them play just the way I like. Great Work!" "Doug - Thanks For All The Great Work. Doug has worked on every one of my guitars, from a one of a kind D'Angelico Electric, to my traveling Cort Joe Beck Models; from a Martin Acoustic to a rare Esteso Classical. They all sound great and the workmanship is second to no one!" "Doug and Sharon - Thanks! Doug Proper does excellent work. He worked on my guitars and it's playing great ! I Highly recommend The Guitar Specialist !" "Doug and Sharon: What a great website and super repair shop! It makes me want to work there!! I haven't seen better. Thanks!" Thanks to you my Fender Lead I can now play lead guitar again. I'm amazed that after such an ouerhaul on the frets, the fingerboard feels like it must have from the Fender Factory 25 years ago, if not better. This guitar not only saw my friend's brother through four years of college and various college bands, but saw me through four college years as well, was lent out to various strange hands, and certainly saw some dark days! After it's final note was played it sadly sat in a comer like a stage prop until I could bring it to you. Now it sounds as clean as it euer did and is a pleasure to play. No longer is it just a prop anymore, it's "Proper". Doug is one of the most experienced and knowledgeable luthiers that I have ever met. He is someone who I trust with my high end guitars. His shop is run professionally and they excel at customer service. When ever I have had a question about my guitar, Doug will always take the time to personally talk to me and is always a true professional. Hey, I really like your web site. No cute backgrounds that make things unreadable. I particularly like the personal style (and the cat page). You get the feeling that the Guitar Specialists are actual humans. Thank you for the reply and the advice, unlike a lot of people working in the music gear sales/repair business you seem to really care about helping someone out even with a simple question If I or, anyone 1 or anyone I know needs guitar repair I'll be sure to send the business you're way. Thanks so much for the extraordinarily quick reply, I think it clocked in at just over an hour from writing it until I had it on my desk. That means a lot to me: I appreciate a business that cares enough to handle their customers (or even potential customers) that way. Got my SG back today.. I couldn’t be more pleased. This thing plays like I knew it should. Thanks for doing such a good job on my guitar. I picked up my guitar at the Fed Ex branch last night. The guitar arrived safely and everything was OK. The guitar plays better then anything I've ever played before, it sounds great! I couldn't put the guitar down once I started playing it. 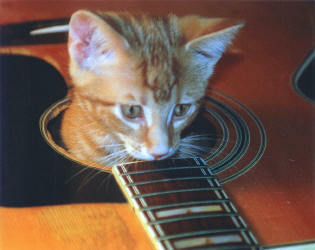 I really appreciate the work you did on my guitar. Thanks for doing such a excellent job. I can't wait to go home tonight and play it!
. . . As for my green Carvin it smokes everything I have ever had in my lifetime. I once played a Les Paul that was set up with the lowest action I had ever played yet it did not have rattle. I knew from that point on it was possible to achieve such good playing action and buzz free tone I just couldn't get it until I found the Guitar Specialist! Who Yaaa!! You should modify your name to: "The Most High Guitar Specialist" since you are now the most high one in my book! The guitar plays excellent!!! I have never had such smooth frets and killer tuning. I played another guitar I had after I was playing the Green Carvin and I couldn’t stand it! The action was sky high in comparison to the Green Carvin. What a serious difference the leveling, crowning, polishing and nut made. Really, I am hard to please and impress and that is stating it lightly. If you have seen my amp work then you know I am obsessive about details. Enjoyed speaking with you today. Just checked out your Web site, and I'm very — well, impressed is really not the right word, but it's the best I can come up with. Actually I'm much more than impressed, and oh, so sorry that I didn't discover you before my banjo's neck went to Umanov. Here's hoping that one of these days I'll be able to give you a chance to provide the treatment it deserves. I got my J185-EC in early December, I found the sound a little "tight". I had the instrument set up with a bone nut and saddle and the action adjusted for the lighter strings I prefer. I am using John Pearse .11 - .52s - the sound is amazing for a new guitar. Another year from now when it really opens up I cannot believe that it will be anything less than spectacular. I agree with the posting on the action at the first and second frets - a professional setup made all the difference in the world. BTW, I used the Guitar Specialist in Pound Ridge NY and enthusiastically recommend them. The workmanship was nothing less than exceptional! My Strat sounds better than it has in years. Thanks again for your effort. I Just got back from TX. The gig went FABULOUSLY well! The GMP played like a dream until the third fret dislodged and shot out the eye of a spectator. Of course I’m kidding about the fret… but the gig DID go great. The guitar arrived safe and sound and was well worth the wait. I only wish you could sort out my other guitars now. Unfortunately I have just taken a teaching job so it might be a while. I know you know what that's like! Thanks for the fine work on my son's Ibanez. He is very happy to have his guitar back in great shape. The guitar arrived and I am sorry we did not e-mail you to tell you so. He was so excited about getting it back. You did a fabulous job. We greatly appreciate your work on the guitar. We have seven guitars, and if we need any more work done on them we know where to go. Again I am sorry I did not let you know we got it back. My Martin D18 arrived without a problem. You do some really beautiful work. Sure wish my D-18V, HD-28V, and D-35 had action that nice! I just wanted to thank you again for a great setup of my surf green 56 relic strat. Intonation is spot-on and re-aligning the neck angle has made a significant difference. You run a pro shop and I look forward to having my other guitars setup in the near future. Try Doug and Sharon Proper in Vista (South Salem) New York, right next to Ridgefield. Check out their website at www.guitarspecialist.com. They did very nice work on mine. Hi Doug, I wanted to let you know how happy I am with the work you performed on my Gibson SJ-200. It plays like a different instrument!!! Unfortunately I did not get to use it on my studio project, as that did not go as well as I would have liked, but I'll be back in the studio soon, and I will use it then. As a business owner who prides himself on quality work and knowledge, I truly appreciate the job you did. I've already told quite a few friends about you, and I anticipate them to call you in the future as their needs arise. Hi Doug…. Just wanted to thank you again for replacing the damaged fret…. Guitar once again plays like a dream! Doug..I want to thank you again for the fine work you did on the Gretsch and for taking so much time yesterday. Hi Doug, Thanks so much for your fantastic work on my guitar. I'm not a pro but I have been playing for over 40 years. I know how I want my guitars sound and feel and its obvious that you are a master at what you do. This is truly professional work and well worth the added expense of shipping across the US to you. I would want no one but you to work on my guitars. Fast, Honest and Easy to work with. My playing is better because of your fine work. Thanks for working on my guitar. It sounds and plays great now. It is like a totally different instrument. Good job sprucing up the Hi-Flyer. It plays as good as it sounds now. I hate putting it down! Hey Doug -- that last tweak you performed on my Martin yesterday really did the trick. It sounds and plays better than I ever expected. In fact, I can say that about all the guitars you worked on for me. But even more than that, I know more about my instruments than I thought there was to know because of the great conversations we've had. I deeply appreciate the time you take to explain things to me whenever I visit your shop. So, thanks for everything. And thanks as well to Sharon for being so pleasant and for all the time she has put into working on my guitars. I very much enjoyed walking around your workshop and meeting Joe Beck today. Thanks for letting me back there. Thank you again for your nut installation, guitar sound like newer before. The Crest plays great, probably better than when I bought it in '69! Just want to let you know that the last “tweak” you applied really did the trick. The guitar now plays as sweet as it sounds. Again, thank you. Give my regards to the “killer” cat. See you soon. 2 years ago you did some work on my acoustic guitar and I'm still pleased every time I pick it up... Thanks again ! I just got off the phone with one of your employee’s (Doug) and wanted to say he was extremely professional and a pleasure to speak to. I have dealt with a number of individuals in the business and don’t recall many that were as genuinely helpful. No wonder you enjoy such a great reputation. Thanks again to everyone there as it's like I just got a new guitar, plays great. Thanks again, I forgot how good the LP can feel! Thanks for fixing the Tele, sounds really good without the hum. Doug just picked up my lefty yesterday...the way it plays I have to think this small fry got as much attention as some of the big name clients I see in your testimonials. Fret buzzing 2 other specialists could not get rid of is gone and the action is more like sasisf--action now. as Jackie Gleason says...how sweet it is. Keep up the good work and feel free to post this if you so desire. Great news, the guitar made it safe and sound and plays better than when I first bought it. The neck and frets are fantastic. Thanks for the great work! Feels like a whole new instrument! I just wanted to thank you for doing such a great job on my guitars. The Stratocaster and Gibson both play beautifully. I'll make sure that my friends find your shop. The M38 and Guild 12-atring you repaired are beyond my expectations. I used them in three concerts last week and they performed magnificently. The best money I ever spent. Hi Doug, thank you so much for doing such an awesome job making my guitar sound what it should sound like. I haven't had much time to play since I got it back being crazed with the kids, but I do know the sound is so different and it is so much easier to play. I had to tell you that. I appreciate what you have done. Thanks again and hopefully I will get to hear you play some day. I just wanted to thank you again for the excellent resuscitation of my Martin. It sounds absolutely perfect. The biggest problem I have now is putting the guitar down when I need to get other things done. But that’s a nice problem to have. We received the bass in nice condition. It is a player now and not a wallflower, thanks to your expert craftsmanship. Thank you very much. Hope you and yours have a very nice holiday season. Happy in the North Pole. Played my Martin at my "farewell" gig last night and it played beautifully. Superb work and worth every penny. Thank you for being such a great luthier. Thank you very much for your great work, time, and tutelage in the set-up of my Les Paul R8! The guitar sounds and feels great!! John Abercrombie really liked the sound and feel of my guitar!! Thank you for making the new bone nut, installing the strap lock buttons, setting the intonation, setting the string height, neck relief and cutting the low E slot on the bridge. I greatly appreciate your fantastic work and attention to detail. Doug, thank you for taking the time to very clearly explain how to file the nut slots. After reading several sources on this procedure, I was utterly fascinated by your cogent explanation and am eager to practice on inexpensive instruments. I just wanted to say thanks for your work on my Tacoma. I've never seen or played an acoustic that was set up this well. The fretboard and frets are stunning, and I'd be hesitant to put my grubby hands on them if the guitar didn't play so well and sound so good. I just received a guitar back from a Luthier by the name of Doug Proper of http://www.guitarspecialist.com. I sent him several guitars for service and repair. The guitar I received back had a fret leveling, crown, fret polish and a new graphite nut installed. How good was the work? The best I have run across to date. As an example of the precision work that I encountered I found the high E & B strings at .016” above the first fret, .018 for the G & D above the 1st fret and .020 for the A & low E strings above the first fret. Because the frets were so perfectly uniform the action was incredibly low without the typical buzz or sitar sound you get with ultra low action. The strings played very clear. I am so impressed with his knowledge as 25 years experience. If anyone needs repair or fret work they should look carefully at the person who is going to do their work for them. I have had many service agents charge me for a less than adequate job on my guitars. Top-notch guitar repairmen are extremely hard to find. If you haven’t already found one I highly recommend Doug Proper. As scrutinizing as I am about my own work I can be hard to please by anyone’s standards and I am beyond pleased with the craftsmanship that The Guitar Specialist offers. Doug also is an excellent tech for any model Rickenbacker or Gretsch guitar. I have discussed these guitars with him and he knows them very well. Check out his site and see some great shop projects. Notable names under his belt. Well I know this guy; he's the luthier who has brought my Santa Cruz & old D-18 back to life, so I can tell you about him. Doug Proper is an excellent luthier, who works full-time doing guitar repair, he's a bit expensive, but worth it. Even with Doug, I've found guitars can take longer to repair than the estimate, and that's typical with a luthier with a good reputation, cos he's busy. In my case, it was because my guitars had more than their share of troubles, which a luthier can't always predict. Anyone I've sent to Doug has been very pleased with his work. The only thing with him is that, because he's a jazz/bebop player (a very good one, plays a 7-string custom archtop elec), he has a tendency to set the action a bit low for flatpicking, but will set it wherever you ask for it. Most recently he did a fret job & setup on my '38 Kalamazoo archtop. His fret jobs are, like butta. Salem NY, <www.guitarspecialist.com> took 13 months to complete the restoration job, which included: new Braz. RW bridge; neck reset/refret/new nut & saddle; new TorTis pickguard; bridgeplate repair; many cracks fixed; new tuners; new ebony pins. Previous recent repair by another luthier included a new nonadjustable truss rod with carbon graphite strips glued next to it to provide stability for its problematic neck (too skinny to allow for an adjustable rod). Doug said the truss rod job was fine, and continued the rest of the project to its completion. I bought this guitar when I was 18, and it's my lifelong companion. It came to me used & broken, and it has subsequently spent many times in repair shops. It's a delicate instrument, thinner and more responsive than most. A friend once said of it, hearing it in a jam, "That guitar is like the sun coming up." When it's been at its best, it epitomizes the best in an old D-18: crisp as a potato chip, buttery, rich yet light, a loud tenor voice that inexplicably has depth in the bass as well; tone that cuts through. Among the challenges Doug faced was fixing a guitar that had seen too many repairs, so there was work he had to clean up before performing the repairs. When he removed the neck, he found several kinds of wood used as shims to the neck block (this is technically its 5th reset, due to the above-mentioned sub-standard repairs; and its 4th truss rod), so he had to clean up all the shims and refit the mortise & tenon joint. He explained it's normal to use a shim or 2 to fit the joint on a reset, but I had a goulash of different woods and way too many pieces. Ideally the shim wood should be mahogany. The original bridge was too low, and had an old Barcus Berry HotDot pickup imbedded in it. When the new bridge was installed, it turned out I didn't need the bridge plate replaced anymore, as the saddle was now the correct height, but since the holes were pretty well chewed up, Doug used the "disc" repair method, where he uses a special tool to remove a precise scoop of wood at each bridgeplate hole, and replace it with a new scoop. The bridge & saddle are at healthy heights again, and the neck is set so that the action is comfortable all over the neck. The fret job is to die for. It plays in tune. Grovers -- you'd have to look reaaaallly close to see it. the neck block area, with all those shims. I really didn't get a chance to hear it after its truss rod replacement -- it went directly from one shop to the other -- so this is my first time listening to the new rod. I may try installing some plastic pins in place of the new ebony ones, or even (gasp!) some coated strings, to see if it brings it into sonic balance. But maybe it just needs to be played. Banjos of the world, beware! And a quick report on my '85 Braz. SCTR. I've had it a month after getting it back from its repairs. ( Doug Proper, www.guitarspecialist.com, in South Salem, NY. )Did a little recording the other night. Sounds & plays like a dream, the tone has such depth. Doug, Thank - you so much for your quick response! The info you provided me was just what I was looking for. I will recommend you to other fellow musicians as well! Again thanks a ton for your time and cooperation with this matter. I recently started taking lessons from Doug and would like to add that he is an excellent teacher and player in addition to being a great luthier. If you’re ever in his neck of the woods, take a minute and stop by his shop. Very nice place and friendly atmosphere. I wish I had known about him before I took my guitar to a local well known music store for a (crappy) setup. The Guitar Specialist is an exceptional place to get your instruments repaired!! I had problems with my guitar that other repair shops could not diagnose. I took it to them (it is run and owned by two luthiers - Doug Proper and Sharon Proper). They took the time to look at the guitar with me and explained everything to me in detail (try getting past a counter person at other places!!). The prices were reasonable and they got the guitar back to me within a reasonable amount of time. It now plays great and I will have all my guitars serviced there. Even though they do repairs for some pretty big people (John Scofield and John Abercrombie) they treated me like I was important as well - great place! I literally stumbled on your website over morning coffee. Incredible!! The best part is I'm in NJ! I just checked out your website for the first time. I was truly impressed. No need to reply, but I'm a thirty-five year player and instructor with several guitars and no clue on how to approach working on them properly...until now. Among my guitars, I have a twelve year old Ibanez 540S with a neck that is so worn out, it's one of the worst I've ever seen or played (you'd laugh if you saw it!). So, I just wanted you to know that your site will be an excellent reference and will aid greatly in that project, and countless other projects I'm sure. Thanks for taking the time to put together such an awesome web site! Im a guitar player and drummer. I was down in you shop in the early summer and want to say it truly ruled. great stuff and good amounts of it. Thanks and keep being the best shop, U GUYS ROCK! Just thought I would tell you how much I enjoyed visiting your web site. Very cool. I'm in the continued process of learning guitar setup and repair. Hope you don’t mind me using what I learned from viewing your work. I've been buying guitars that have been broken or messed with and repairing them I hope to one day come close to your skill level. Have a good one. Mi name is Rodrigo, I am from México city and I also work (my girlfriend and I) in a very small guitar shop I owned , But let me tell you that you guys are my inspiration to keep on guitar repair. This is why I would like to ask you for a big favor...If you could write me an E-mail in which you make some comments and tell me to keep on...this mail I will hang in my shops main wall so I could see it every day...Thanks alot guys for being the best couple in the luthier business. God bless ya. No specific issue or problem, just wanted to say what a wealth of information I found on your website... I'd punched in 'guitar finish restore Meguiar's since I'd read somewhere about using Meguiar’s products to buff out fine finish scratches and was unsure of the specific products to use and voila - your website appeared and within one of the Q&A's was the answer I sought. After browsing some of the other questions I learned some things that are helpful in supplementing my overall grasp of guitar care and repair. If your are the Guitar Specialist webmaster, you have put together a great web site. I am very impressed that you and your company are willing to share your repair experiences with the world. From what I see in the photos, you really know what you are doing when it comes to Guitars too. Honestly, the repairs I see in the photos take a bad situation (for the guitars) and turn them into something that never happened. You all seem very adept at invisible repair work. Keep up the great work and if I am ever in your area, I will definitely stop in to say hi. 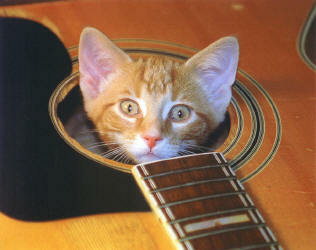 First of all, a quick greetings from a fellow music and cat lover. I've been working in the repair shop at Elderly Instruments in Lansing, MI for over a decade now. A coworker brought your website and cat gallery to my attention recently and I felt compelled to send you a brief e-mail. Attached (hopefully) are a couple of photos I thought you might enjoy. Several years ago (at home, not at Elderly) I was restringing a friend's guitar on my dining table. I walked away for a moment and came back to find that one of my cats (Boo, named prior to this incident) had crawled through the soundhole and was exploring the inside (no doubt checking for loose braces...). I grabbed my camera and got a few snapshots as he was emerging. Unfortunately, Boo ultimately proved to be too adventurous for his own good and was hit by a car before his first birthday. Kudos for putting together a terrific web site: classy but fun, lots of info. but nicely organized and easy to navigate. Lastly, I liked the Albert Schweitzer quote. It reminded me of the opening quote/statement from fiddler Kevin Burke's website (www.kevinburke.com): "Music is a release from the tyranny of conscious thought". Gold Epiphone ES 295 w/ Bigsby. This is an awesome playing guitar. The P-90's sound incredible - play Mystery Train through an echoplex (or even a digital echo) and you'll get chills at how close you can get the Sun sound. How this guitar differs from other Epi 295's you'll find is that when I got this guitar, I had the frets leveled and recrowned by Doug Proper of www.guitarspecialist.com. Doug is a genius, and the action on this guitar can be set extremely low without fret buzz. A few weeks ago I posted to the newsgroup about my search for 6 humbucker pole-piece screws. Doug responded and said that he might have some that'll work... well, all at his own cost; he sent me an entire humbucker in the mail!! The pole pieces not only work in my humbucker, but the cover will come in handy as well! So I'd publicly like to thank Doug for his effort and generosity, bringing my guitar project one step closer to completion. Doug Proper. http://www.guitarspecialist.com He does all my work. He's an authorized repair person for Gibson, Fender, Ovation, Martin..I know that he does work on Scofields, et al, axes. Doug just performed a major restoration on my '63 Gibson L7C. Complete refret, planed fret board, new nut, new bridge, set-up, etc. That axe always sounded good but now, holy cow it plays 'like butta'. The luthier is Doug Proper. (Not Doug’s' Plugs) http://www.guitarspecialist.com. Doug’s also a fine player. He plays with John Abercrombie, Jack Wilkins, Joe Beck et al. He did a fine job. Try Doug Proper at The Guitar Specialist at www.guitarspecialist.com. He's in NY just across the border from New Canaan, Connecticut (about 50 - 60 mins from the City) and he does great work. I stopped into his repair shop, The Guitar Specialist, a few weeks back with an older Taylor I was thinking of buying and he was great to deal with from the repair shop end, really took some time to show me what was wrong with the guitar and saved me from making a mistake. There is a great repairman in South Salem, which is in Westchester County not too far from Ridgefield,CT. His name is Doug Proper and you can check out his site, THE GUITAR SPECIALIST. I would definitely give him a call 914-533-5589 if you don't feel like trekking down to Matt Umanov's, Mandolin Brothers, or over to Buzz at Lark Street Music in Teaneck, NJ (Bergen County). Doug has done restoration work for Paul Simon, and does all the repairs for jazzmen John Scofield and John Abercrombie. He and will work on virtually anything with strings. Doug is restoring a 40's L7 Archtop for a friend's dad right now and is going to redo all the botched work which a local Martin dealer/authorized DISrepair center inflicted on my poor D-35. I recently had a good experience with Doug Proper, but he's not in the City. He's in South Salem, in Westchester County. I just realized you live in CT. A bit of a drive, but not all that far is Doug Proper, the Guitar Specialist. He specializes in vintage repairs. His business is known as the Guitar Specialist. Highly recommended, and very fair and honest. He's in Westchester County, NY, about 10 minutes from Ridgefield, CT. I go to a great tech in Westchester County. From NYC you'd have to drive north and come up the Hutch into 684 and he's not too far from White Plains airport. His name is Doug Proper, his shop is called the Guitar Specialist and it's located in N. Salem, NY. Give him a call and talk with him on the phone. He is very helpful and he is authorized to do service for Taylor. If you are the original owner a neck reset should be covered. He discussed this subject with me when he reset the neck on my 30 year old Martin. BTW, I found Doug after the local authorized Martin dealer/repair shop in CT botched a neck reset. Doug got on the horn with Martin service while I waited, discussed the poor work, and Martin ended up taking the guitar back and resetting the neck, again, under warrantee. When I finally got the guitar back from Martin, the action was 1/8" high, still within their archaic specifications, but a bear to play above the 5th fret. I am lucky to have found a great independent repairman who is authorized by Martin and everyone else. He does work for some very famous people, and ain't cheap, but he's worth it. He planed the neck, did a refret, replaced the POS micarta saddle and nut which Martin put on after they removed the original bone, intonated the saddle with hand filing, and got the action as low as a Taylor. This cost more money than I want to admit, but it plays better than when it was new, and sounds like...a 30 year old Martin. Doug Proper is one of the best. He is located north of NYC in S. Salem, NY. Martin sends him their problems and they listen to him. He served as my advocate with Martin and called them while I waited after seeing my botched Martin for the first time.